We have three greyhounds, and, to be honest, they're fairly well-behaved most of the time. But they bark and whine and growl just like any other dog. What I need is a way to train them not to do those things. I was thinking perhaps a dog whistle, something to blow when they do whatever behavior I want them to stop, and is just irritating enough to keep them from doing whatever. I was also recommended "Bark-Free" from the reputable SkyMall catalog. Fortunately my procrastination paid off. 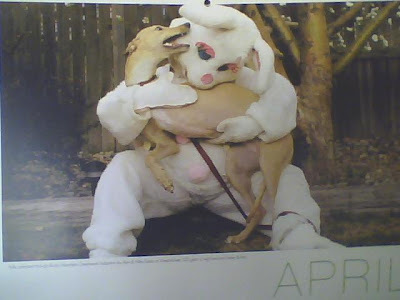 This month's photo in the Celebrating Greyhounds 2009 wall calendar has got me covered. They haven't barked all month. Eldritch: Frankly, I'm terrified. But not of that picture. Now, don't get me wrong, I am deeply unnerved, unsettled to my very core by that image. I may never bark again. But what really terrifies me, what chills be to the very core of my being, is the existence of a Celebrating Greyhounds 2009 Wall Calendar. "She huddled alone in a borrowed tent. Tears, mingled with soot, streamed down her face. The smoke-filled air burned her eyes and lungs. She had just watched her home completely burn; yet she was thankful because she shaved her 15 cherished Greyhounds"
They all died, but thankfully they were clean-cut when it happened. Eldritch: They all died, but thankfully they were clean-cut when it happened.